Home → E-Juice → Space Jam E-Juice Review: Is Astro Their Best E-Liquid Ever? Space Jam E-Juice Review: Is Astro Their Best E-Liquid Ever? Before they become to be known as Space Jam, many of us knew this company as Space Jam Robo Fuel. Since 2012, when it was founded, Space Jam has gradually risen to become a top premium e-juice brand in the United States. Today, you can find their e-juices almost everywhere, from brick and mortar stores to top online stores, and this is due to the fact they create some of the most delicious fruit-flavored e-juices. Astro e-juice by Space Jam is an all American vape that brings together a refreshing mix of apples and strawberries coupled with exceptionally flavorful and juicy peach undertones. Inhaling it gives you that soft apple accent while exhaling brings a strawberry-peach feeling. You have the option to pick between two bottle sizes: 15 ml and 30 ml and for nicotine strength purists, there’s a wide range of nicotine levels to pick from as well. If you really want an e-juice that is sure to excite your taste buds and leave you asking for more, be sure to try out the Astro Juice by Space Jam. We’ve dissected it to reveal what’s it’s all about ahead in our Space Jam Astro review so be sure to read through to the end. If there’s an area in which the Space Jam Astro wins hands down, then it’s the taste. Three fruity flavors, each with its unique sweet taste, all for your taste buds. And thanks to its great combination of PG and VG, vapor production as well as flavor quality and taste have all been well balanced out to your satisfaction. The throat hit is reasonably strong but just enough not to leave you enduring horrible coughs. However, on extremely hot vapes, the taste might end up sickly-sweet and to those who detest candy flavors, this can be a turn-off. But looking at what the Astro is able to give, you are certainly not going to find problems with its pricing. One reason to be confident in Space Jam’s Astro e-juice and every other e-juice flavor they create is due to the fact they are all developed not only in a GMP but also ISO certified lab. For those who don’t know about this two, GMP simply stands for Good Manufacturing Practices. It’s a manufacturing system that ensures consistency in product quality by qualifying it against set standards. ISO (International Organization for Standardization) specifies the standards by which you should operate your firm right from management through to manufacturing. So in a nutshell, this Space Jam e-juice meets the industry’s highest set standards. When it launched back in 2012, the entire vaping industry was in a fledgling state but the arrival of Space Jam turned things around and took vaping to a whole new level. The brand has appeared among the top e-liquids makers’ lists and this has seen many vapers want to try out their Astro e-juice, a personal favorite choice for many vaping enthusiasts. It’s handcrafted to perfection and fine-tuned not only for the top quality but also complexities. Astro is definitely an exceptional flavor, a fact that every Space Jam e-juice review agrees with. As we saw earlier, inhales reek of apple/peach tea while the exhales bring that delicious strawberry feeling. In the end, you actually enjoy an after taste of its three flavors. The throat hit is strong, just enough not to make you cough. Vapor production is incredible. Even on low watts, you are likely to blow huge clouds. Once you draw the vapor into your mouth, the sensation you get is of pure fruity sweetness. As you inhale, you will start to discern the sweet flavor of apple and moments later, flavors of strawberry and peach will register and start to be amplified as you start to exhale. As the aftertaste lingers on, you will be left with a crisp dry sensation similar to that you get when you eat an actual apple but unlike the real drying of the mouth, your salivary glands will still be activated. A good number of vapers love to steep e-juices after purchasing them mostly by placing it in a dark area with a temperature of about 60 degrees Fahrenheit. 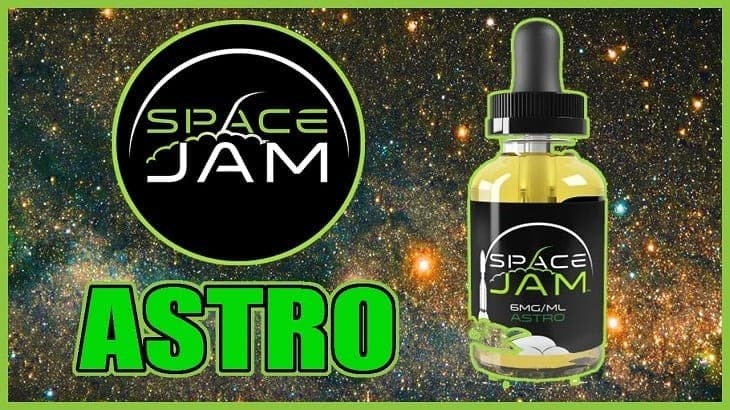 For this particular Astro e-juice from Space Jam, you are set to get mixed results. Much as this might amplify the apple accent and the strawberry notes, the throat hit will be negatively affected and the sweetness too will take a slight dip. This is something not every Space Jam e-liquid review will tell you about. Much as the flavor from this e-juice is close to perfect, on extremely hot vapes, the flavor might end up with an extremely sickly-sweet taste. If you are one of those people who loathe candy flavors, you definitely are going to hate that taste. Astro juice from Spam Juice comes in a cylindrical glass. What’s good about glass is that it’s inert, looks classy, and can last you longer if you handle it carefully. Aside from being non-childproof, the black screw-top cap also comes with an attached dropper. If you have kids around, ensure you use and store this e-liquid from Space Jam with extra care. On its label, it has a couple of information that you may find helpful, some of which include the company name, the liquid name, the nicotine strength (mg), the liquid contents (ml), a list of ingredients and so much more. Nicotine strength is one of the many factors that determines whether you are going to get a positive or negative vaping experience. For some people, a low nicotine strength might not be satisfactory while for others, high nicotine strength is just too intense for them. Most common PG/VG Ratios include 70/30, 50/50, and 60/40. Space Jam's Astro e-juice features a 50/50 PG/VG ratio, which is great because it balances the two giving you the best of both. With Apple, Strawberry, and Peach as its primary flavors, Astro e-juice from Space Jam is the e-juice you don’t want to miss out on. Coming from a top brand and having met all the top industry standards, Astro deserves all the attention and honor it has received from vaping enthusiasts. In this Space Jam e-juice review, we’ve seen that everything that matters, from flavor quality to vapor production to aroma and PG/VG Ratio has definitely been done to perfection. As a vaper, you can only anticipate an exceptional experience when you opt to use this e-liquid. For the price of Space Jam's Astro e-juice, you definitely are going get a good bang for your bucks.